*Interest rate of 5.75% p.a. is based on a secured loan for 60 months. Our risk based pricing means the interest rate may vary between 5.75%p.a. and 12.75% p.a. depending on our credit assessment and the detail in your application. Interest rates may change and margins may apply in some circumstances. 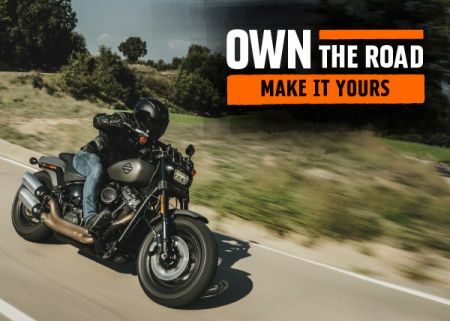 Credit provided by BOQ Credit Pty Limited ABN 92 080 151 266 (BOQC) (Australian Credit License Number 393331) trading as Harley-Davidson Finance. BOQC is a wholly owned subsidiary of Bank of Queensland Limited ABN 32 009 656 740 (BOQ). BOQ does not guarantee or otherwise support the obligations or performance of BOQC or the products it offers. BOQC’s standard credit assessment criteria apply. Fees and charges are payable. ** Comparison rate is based on a 5 year secured consumer ﬁxed rate loan of $30,000. WARNING: This comparison rate is true only for the examples given and may not include all fees and charges. Different terms, fees or other loan amounts might result in a different comparison rate. Terms and conditions available on request. © H-D® 2018. Harley®, Harley-Davidson® and the Bar & Shield logo are among the trademarks of H-D U.S.A., LLC.